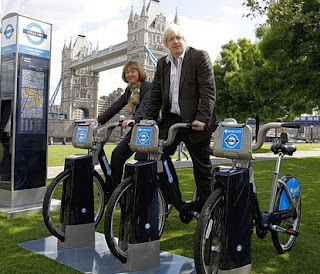 Giving keen interest in bike-sharing, the world financial giant Barclays Bank buys the naming rights to London's pending "Cycle Hire." According to the London Evening Standard, for £25 million ($36.4 million USD) every one of the 6,000 bikes will carry six Barclay Bank logos. The Bank is so keen on bike-sharing that it wants to add more stations to the planned 400 as to service its banking headquarters in East London. The selling of the naming rights gives a big return on London's investment in bike-sharing even before the system begins operating. Barclays Cycle Hire starts on July 30, 2010. This is a very good development for funding large systems throughout the world. Along the banks of the Avon River, the small Hourbike bike-sharing system, see The Bike-sharing Blog September 2009, did not gain much interest in Bristol. The 18-month old system ceased operation this month. Thanks for this website! I am dreaming about starting a bike sharing program at a small private university in Houston, TX. It is very helpful to see the systems that are already in place and the compromises they have had to make.